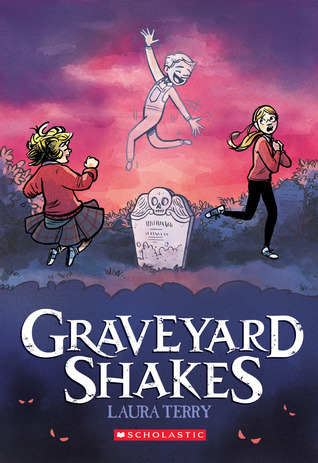 I finally finished the last of my 2017-released graphic novels with Graveyard Shakes by Laura Terry, a middle-grade graphic novel that straddles the line between realistic fiction and ghost story. 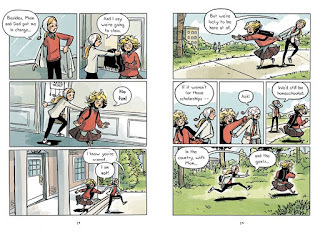 Sisters Katia and Victoria have always been home-schooled, so their start at Bexley Academy, a wealthy boarding school, as scholarship students is a bit rocky. Victoria desperately wants to fit in and make new friends, but Katia is dismissive of her new classmates, who she refers to as "sparkly show ponies!" Katia dances to the beat of her own drummer (and in fact, she is quite talented musically) and is messy and impulsive. As Victoria and Katia try to adjust to their new school, they are unaware of another challenge lurking nearby. 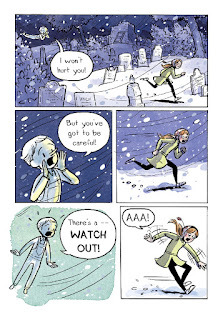 The graveyard next to the girls' new school is home to a bevy of ghosts, including one cute little boy ghost named Little Ghost. More troubling, however, is a mad scientist who lives underground with the ghosts. He can only keep his young son "alive" with black magic and the sacrifice of a living child every 13 years. You guessed it...it's been almost 13 years since the last one, so when Katia stumbles into the cemetery late one stormy night, upset about things at school, and Victoria goes running after her, they are in far more danger than they realize. 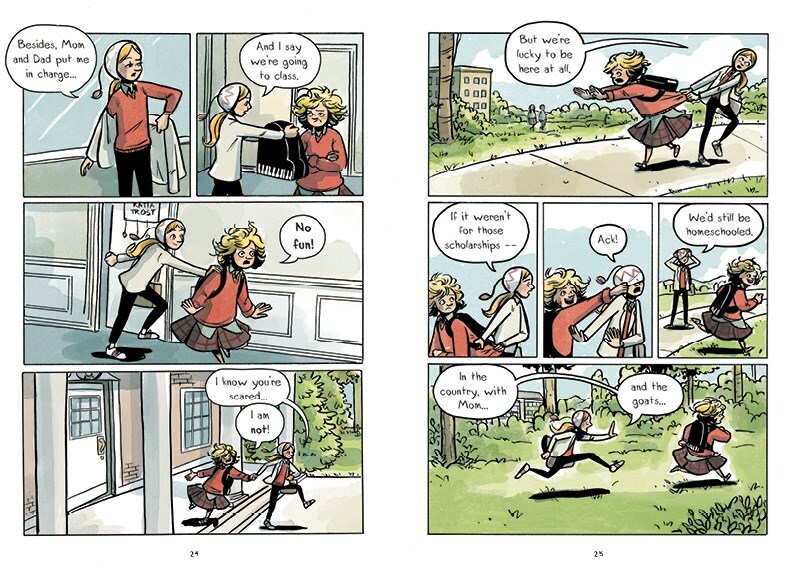 Pages from Graveyard Shakes, showing the two sisters. 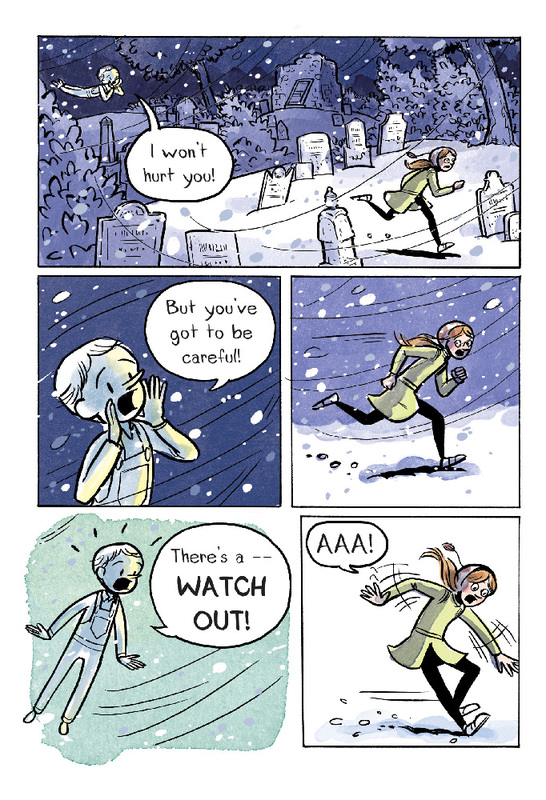 I enjoyed this colorful and creative story that combines humor with a bit of mild horror. The story tackles both real-life issues, as the girls struggle to adjust to school and get along with each other, and supernatural ones. It's a nice balance that middle-grade readers will enjoy. Or order Graveyard Shakes from Book Depository, with free shipping worldwide.